In a stand mixer fitted with whisk attachment, cream together cream cheese and sugar. Slowly add in the amaretto and whipped topping, beating until well combined. Set aside. 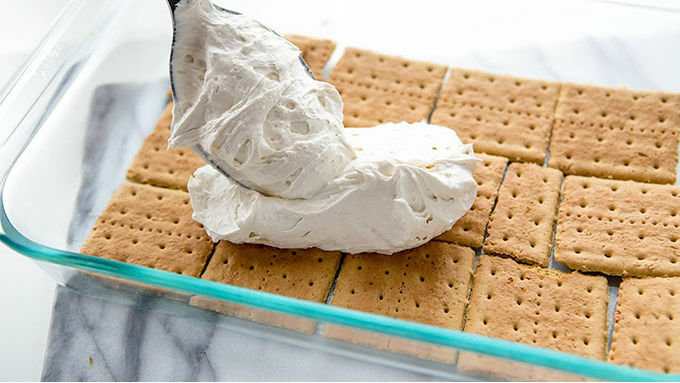 Spray the bottom of 9x13-inch baking dish with non-stick spray, line with 7 graham crackers. Spread half of the cream cheese mixture on top of the graham crackers. In a large bowl, microwave one jar of jam until warm, then stir in half of the strawberries. Spread this mixture on top of the cream cheese layer. Top with a second layer of graham crackers and cream cheese. Cover and refrigerate overnight. Just before serving, microwave second bottle of jam until warm and stir in fresh or thawed strawberries. Allow to cool until no longer warm to the touch, then spread across the top of the cake. Slice and serve. Every Sunday in college, my dorm room full of girls would walk around to the other side of the apartment complex to make a meal for the boys. We’d gather all of our rice and beans and ramen and conjure some sort of homebaked dish to share with a crowd of 20 or so starving Freshmen. In return, the boys took turns treating us ladies to homemade desserts. And it was on one of these days that I was introduced to the classic “Éclair Cake”. 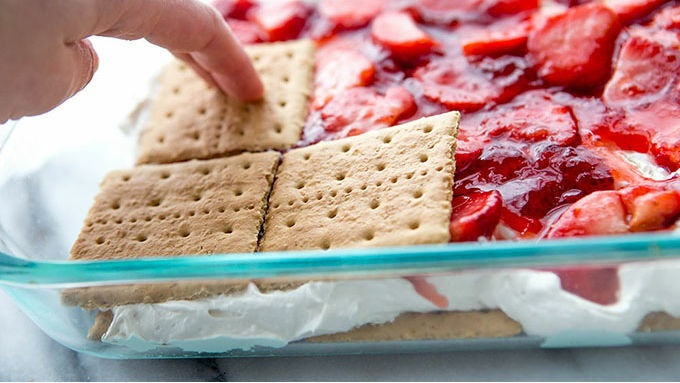 Quick and easy to make, the vanilla-pudding-and-whipped-cream flavor combo tucked inside layers of graham crackers was a crowdpleasing hit. The girls were begging for the recipe, the boys were scrambling for an extra slice. The Dessert Maker stood in hero glory, basking with a thick smile across his face, “Yeah. I knew you guys would like it. It took, like 5 minutes to make.” There’s something about 9x13-inch pans filled with creamy, refrigerated layers of dessert. Everyone loves such. Nobody can get enough. And so, when I set out to create a fresh new twist on the classic éclair cake of college days, I knew it was going to be good. 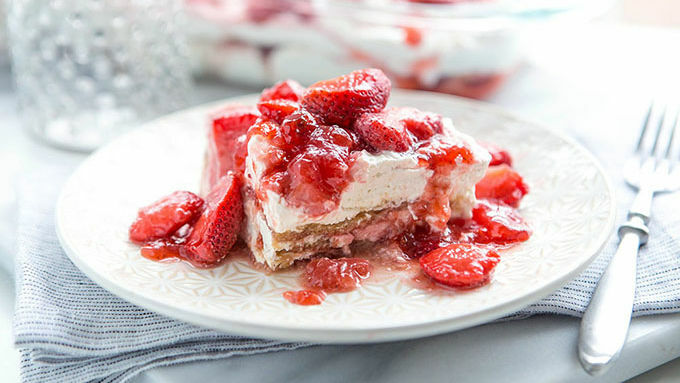 But I had no idea how irresistible a Strawberry Cheesecake Lasagna version would actually be! Fast forward 6 forks and three plates later, I can confirm to you that the éclair cake twist I’m about to show you is a winner, winner. Just forget dinner. Dive into this dish. Tote it to your next potluck. Make it for your birthday. Drown your sorrows within its strawberries. Share it with the dorm. This one is pure and yummy love. And so easy. You can’t help but smile and nod, “Yeah. It took, like, 5 minutes to make…” Here’s your lineup. A few basic ingredients. Cream cheese, whipped topping, graham crackers, sugar and strawberries. And jam. And the top secret ingredient in that little bowl in the corner? Amaretto. Because if you didn’t know before today, amaretto and sweet strawberries are like Kim and Kanya. They should just be together forever. So perfection. 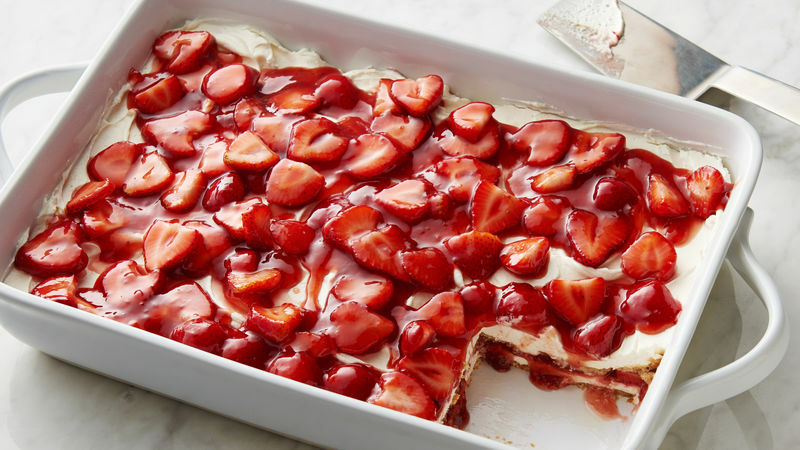 Just before serving, prep a second layer of jam and strawberries (you can use fresh sliced strawberries, if you want—just serve within 2-3 hours for freshest flavor). Then slice, serve and enjoy!